When she was 16 years old, Kristi Odom picked up her grandfather's camera and fell in love with the beauty of the natural world. Ever since, she's been driven to capture what's real, raw and compelling about that world. An internationally acclaimed photographer and sought-after motivational speaker, Kristi travels the world shooting, teaching and sharing her insights. From destination weddings in Thailand to conservation projects in the jungles of Borneo, she's always on the move, always ready to connect with others. She has received a Master's accreditation from WPPI (Wedding and Portrait Photographers International) and won over 60 international photography awards. Her recent work has been exhibited twice at the Smithsonian Institution's National Museum of Natural History. In presentations and at conferences, Kristi teaches photographers to focus on improving their work by creating an emotional connection, and urges them to give back through personal projects. "By using the art of photography I want to help people share empathy for one another and make people care more for the natural world," Kristi says. By using the art of photography I want to help people share empathy for one another and make people care more for the natural world. An orangutan mother touches her son¹s neck in the jungle of Bukit Lawang, Sumatra, Indonesia. An orangutan mother embraces her child in Bukit Lawang, Sumatra, Indonesia. A whale shark swims underneath me in Cenderawasih Bay, Papua, Indonesia. The light diffracted around my body to bring it¹s rays onto the back of the shark. A cub rests against his mother as she waits patiently for salmon in Brooks Falls, Katmai National Park Alaska. A cub rests against his mother as she waits for salmon to swim past in Brooks Falls, Katmai National Park Alaska. A bear stands patiently awaiting salmon to swim past in Brooks Falls, Katmai National Park Alaska. I laid on the ground to stabilize my camera and lens to get the movement of the rushing water against the stillness of the bear. A bear in Brooks Falls, Katmai National Park Alaska. Two mirrored consecutive frames of a lion photographed in Tsavo East, Kenya. A cheetah stalks his prey in the Maasai Mara National Reserve, Kenya. See more of Kristi’s work at her website: www.kristiodom.com. Check her out on social media: on Facebook and Instagram. 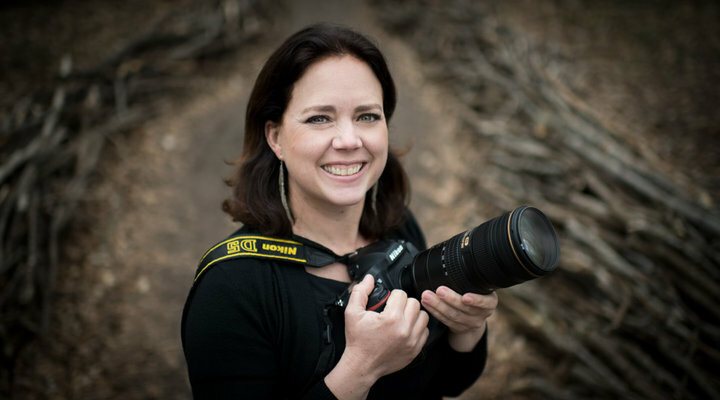 Wedding & Wildlife photographer Kristi Odom is a Nikon Ambassador. Learn more about her photography.